People all throughout Central Georgia gathered on Saturday to remember 8-year-old Jai'mel Anderson. Anderson was killed in a shooting at the Indian Oaks Apartment in Fort Valley on Tuesday. The death left many parents, like Vernard Hodges, in shock. "I have a 10-year-old son, and my first image was, 'What if that was him?'" Hodges said. Hodges is no stranger to the Fort Valley area either. "Fort Valley is in my DNA. These are the streets I grew up in," he said. Fort Valley police issued three more warrants in the shooting death of 8-year-old Jai'mel Anderson. A statement from the Fort Valley Police Department said they arrested Jeremy Quillan Jackson, 24, Antonio Garvin, 20, and Kristian Jamal Wipfel, 21, on Friday night. All three are from Macon. All of them have been charged with murder and are being held at the Peach County LEC. Jai'mel Anderson was shot and killed early Tuesday morning, and two men are already in custody, also charged with murder. A total of five men have now been charged in Anderson's death. Chief Spurgeon said in the release, "It is our intention to arrest and prosecute anyone to the fullest extent of the law anyone who conspired, assisted, or facilitated with any aspect of this horrible crime." The emphasis was Spurgeon's in the new release. Murder warrants have been issued for two men in connection with the shooting death of an 8-year-old Fort Valley boy early Tuesday. 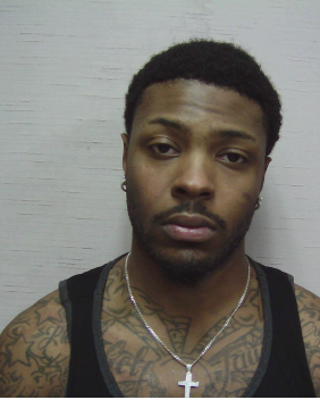 Police said the warrants were issued for Dennis Eason, 25, of Fort Valley and Tevin Sams, 21, of Lizella. Dejad Williams, the stepfather of an 8-year-old Fort Valley boy shot to death Tuesday, has been arrested on gun and cocaine charges. Jai'mel Anderson was killed early Tuesday when a gunman shot through the door of Williams' Indian Oaks apartment on East Church Street. Police executed a search warrant of Williams' home after the shooting and found cocaine and a firearm, according to a Fort Valley police news release. Williams, 22, is charged with possession of cocaine with intent to distribute, possession of a firearm by a convicted felon and probation violation. One person died Friday afternoon when a four-wheeler collided with a pickup truck, according to Crawford County's sheriff. According to Sheriff Lewis Walker, it happened around 1 p.m. near the 3500 block of Richardson Mill Road. That's outside Fort Valley. The driver of the four-wheeler was killed in the accident. The victim's name was not released. No further information was released on the accident. The sheriff's office and the Georgia State Patrol are investigating. Three men charged with dog fighting in Crawford Co.
Three men face dog fighting charges after deputies found two dead pit bulls and a fighting ring, according to the Crawford County sheriff. When deputies responded to a dog-fighting complaint, they saw several people run off. Then they found the two pit bulls inside a building, and the dog fighting ring inside a different building. According to the news release, investigators aren't sure if the dead dogs were fighting or beaten to death. Deputies removed seven grown bulldogs and two puppies from the site. Three new trucks will be game changers when it comes to fighting fires in Crawford County. The fire chief says these trucks will be a big boost to the department and is expected to have a long term impact on the community. Chief Randall Pate is ecstatic that thanks to the US. Forestry Commission these more than forty-year-old trucks will officially be retired. The new trucks were given to the county to replace and upgrade the old trucks, or knockers, they had been using. The knockers could only hold 1000 gallons, but the new trucks can hold triple that, freeing up other volunteers to help fight fires.